As publishers often do for comics series that get turned into multimillion-dollar films, DC Comics is offering up a new Suicide Squad series. The first issue is not very good. But there’s been a much better version of the motley crew black-ops squad concept running around in the wild that the House of Superman has nothing to do with—and that’s probably for the best. In the run-up to the release of the Suicide Squad movie, DC’s been pumping out bunch of character-centric one-shots, along with a Rebirth issue that shows the team coming together despite President Obama’s misgivings. This week sees the release of the first issue of the new series, which sends the team on a do-or-die mission to secretly steal a cosmic artifact from another country. The main focus of the issue is the first-person narration of hardass government functionary Amanda Waller, who collects and deploys supervillains for full-deniability missions. She comes across as meaner and blander than previous iterations and the villains all feel like they’re playing to rote types. Harley’s wacky, Flag’s a conflicted squarejaw struggling to follow orders he doesn’t agree with, and Captain Boomerang constantly cracks wise in sophomoric ways. It reads expressly like a comic made to appeal to people who have seen the movie, which makes good business sense. But the movie didn’t home in on what’s made the best Suicide Squad runs memorable over the years and these first few comics feel like they’re making the same mistake. An independent superhero comic created and produced by Michel Fiffe, Copra has all the quirk and personality that Suicide Squad should. It’s an energetic homage/pastiche to the tones that were prevalent in the cape comics of the mid-1980s and early 1990s. Stories get narrated with cranky first-person voices, there’s a loving use of grimy artistic technique and skewed double-page layouts, and many characters are readily apparent analogues to popular Marvel and DC characters like Deadshot, Doctor Strange, and the Punisher. Fiffe does more than just replicate the vibe of comics he grew up on, though he updates the aesthetic of a singular point of time and fuses it to a personal approach that comes across as more experimental. 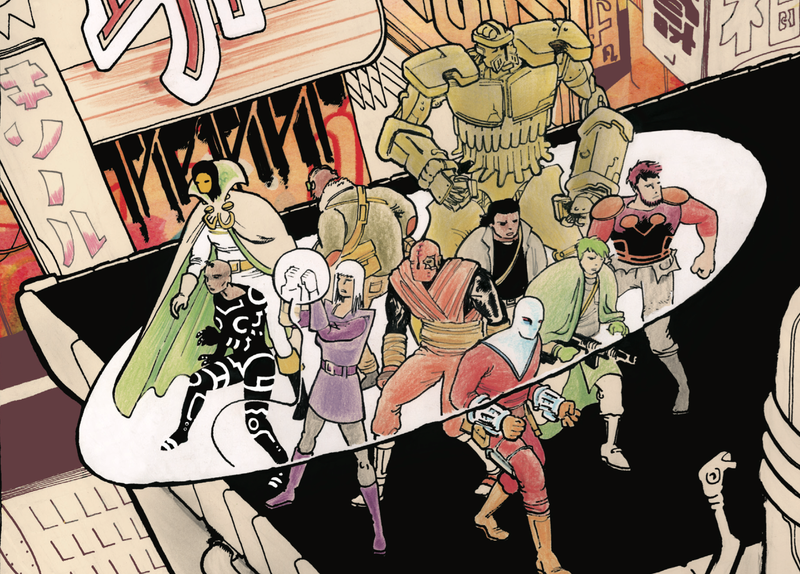 Fiffe has gotten mainstream superhero gigs from Marvel, including a short run on All-New Ultimates, but his work on Copra occupies the middle space between professional cape comics and alt-zine enthusiast. His work throbs with the love of a fan who’s pulled characters from the margins of old high school notebooks and shines with the execution of a seasoned talent. There are minor differences to the proceedings: Copra stars a loosely-knotted squad of mercenaries, not dragooned criminals, and the gruff team leader is Sonia Stone, not Amanda Waller. Part of the fun of reading Copra is in recognizing the characters that Fiffe is referencing and seeing how he molds into different shapes. The analogue for Dr. Strange’s acolyte/girlfriend Clea is sassier and tougher than the original and the Count Vertigo-alike isn’t as depressed as the one in DC Comics. The best Suicide Squad comics were filled with C- and D-listers that writers John Ostrander and Kim Yale infused with added backstory and personality quirks. Then they sent them off to die or, at the very least, betray or harass each other. Actual harm befell members of the old Squad. In their attempts to bump Suicide Squad to the A-list of recognizable properties, DC has diluted the maverick appeal of the concept. I don’t believe that Killer Croc, Harley Quinn, Deadshot, or any of the other members of the line-up in the new Suicide Squad #1 are going to die on missions or by Waller’s hand. They’re a franchise now. In Copra, characters actually die. In fact, they die in the first issue, the result of a double-cross that gets them branded as mass killers and wanted all over the world. As Stone scrambles to gather resources and pull a team together to get the bottom of the betrayal, new players come into the fold, some with an agenda that motivates them in occasionally dissonant ways. These antiheroes all feel untidy, pried off crusty deposits of nostalgia without having their rough edges sanded away. The way that the characters talk to themselves or each other reveals the shape of their interior lives. We know when they’re fed up, nervous or scared. They know that tomorrow isn’t promised to them and that makes them feel more human than the current “real” versions of the characters who inspired them.